Ah, springtime is in the air and we're feeling invigorated seeing signs of new life budding all around. Similarly, we think you'll find plenty of inspiration in this week's wrap up of our favorite posts. After you've digested these gems, be sure to get out and enjoy the fresh air! There's a lot of advice out there about how to write effective copy. But it's not always a good idea to DIY if you're not a pro. Sonia Simone gives some solid advice on when to do it yourself and when to hire some help. Owyang of Altimeter takes a deep dive into corporations who are deemed "wealthy" by annual reports and have had a formal social media program with at least two years of data. Eye opening and life affirming data! If your bosses are dragging their feet on Social Media then use this as a catalyst. Fastest way to get fired - Tweet obscenity about the clients city from their account! One to file in your "at least I have never done that file". Ardath Albee shares her thoughts on why B2B marketers are missing the boat by ignoring lead nurturing. Lee Odden explains the risks to short-term thinking with content marketing and ways that many companies fail in this area. David Reich shares suggestions to make your blog less about you and more about your audience. Bob Apollo lays out three common reasons that B2B prospects end up not buying a solution -- and how you can head them off at the pass. Eric talks about some of the concepts in the new book he co-wrote with Paul Gillen - Social Marketing to the Business Customer. "A landing page is not a magazine spread." Definitely not. Two entirely different animals with very different missions. Don't confuse the two. If you haven't had time to read Gary V's latest, Jay Baer has a great breakdown of some of the book's concepts. And if you don't have time to read those lengthy business books, try these on for size. Business and life lessons taught by the likes of the Lorax and Winnie-the-Pooh. interesting article about Savvy Week .Ah, "springtime is in the air and we're feeling invigorated seeing signs of new life budding all around. " 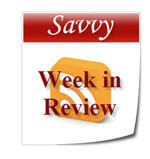 "Similarly, we think you'll find Savvy Week in Reviewplenty of inspiration in this week's wrap up of our favorite posts. " it's really great that you wrap up the week in a article. hey , thank you for sharing this helpful content.